I am always delighted to receive publication from the Cornell Lab of Ornithology. The Winter Bird Highlights from Project FeederWatch 2010-2011 is chock full of information including a regional roundup of birds sighted by citizen scientists. The Top-25 List for the the Mid-Atlantic, East Central, Northeast, Great Lakes, Allegheny, & Atlantic Canada Regions included Chickadee, Dark-eyed Junco, Mourning Dove, Downy Woodpecker, Blue Jay, American Goldfinch, Northern Cardinal, White-breasted Nuthatch, House Finch, Tufted Titmouse, and more. The New York State Top-25 List included Black-capped Chickadee, Dark-eyed Junco, Downy Woodpecker, Northern Cardinal, Mourning Dove, Blue Jay, White-breasted Nuthatch, American Goldfinch, Tufted Titmouse, Red-bellied Woodpecker, and more. 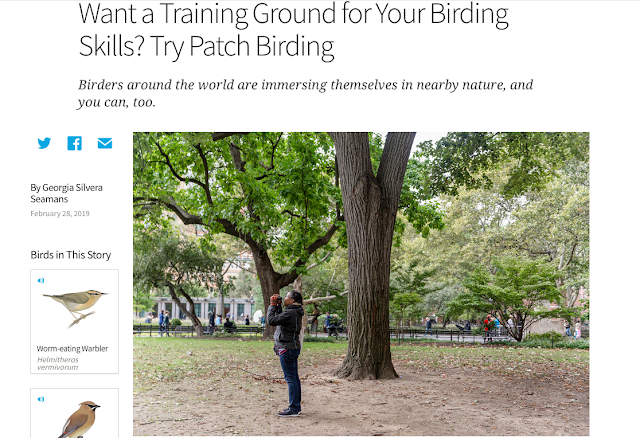 If you have not spent time in the Washington Square Village Sasaki Garden in Manhattan, you should do so for many reasons, one of which is the bird life. Hubert J. Steed has been photographing the birds that frequent the Garden and his photo galleries are available at http://www.pbase.com/hjsteed/wsvg_sg_birds. Steed has recorded Northern Cardinal, Mockingbird, Thrasher, Catbird, Mourning Dove, Pigeon, American Robin, Yellow-bellied Sapsucker, Hermit Thrush, Sparrow (House & White-throated) and European Starling. A great Top-12 List for a 1.5 acre urban garden!